Happy Book Birthday to THE SHADOW THRONE! Happy book birthday to the much anticipated THE SHADOW THRONE, Book 3 in The Ascendance Trilogy by Jennifer A. Nielsen! Pick up a copy and learn what Kirkus said goes "From one cliffhanging episode to the next, wily Jaron's rebellious, undisciplined spirit carries the day as he battles to save everything he holds dear." A THIRD and FOURTH Starred Review for EASTER CAT! 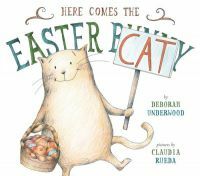 Now there is a third and fourth STARRED review for Deborah Underwood's HERE COMES EASTER CAT. Not that we're surprised, who doesn't love that rascally cat? Kirkus posted a great review of what they call an "utterly endearing" and "whimsical story" with "a playful but sophisticated mood". And Publisher's Weekly called it "an Easter book with real personality" and "a highly appealing blend of slightly edgy humor and underlying sweetness." Congratulations, Deborah! An Honor for SOPHIE'S SQUASH! This just in! 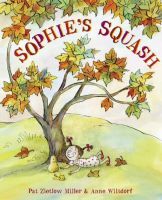 Pat Zietlow Miller's adorable SOPHIE'S SQUASH is a 2014 Ezra Jack Keats Honor Book Award Winner. Yay, Pat! We are so happy for you and Sophie! Happy book birthday to Susan Vaught's INSANITY! If you get a chance, wish Susan a happy day. And even better, pick up a copy to read. We are loving the well-deserved praise this book is getting! It's full of creepy goodness. Yay, Susan! Kersten Hamilton's THE MESMER MENACE, book one in the Gadgets & Gears steampunk-for-the-chapter-book-set series, just came out in November. It was a Kids' Indie Next pick; PW called it "fast-paced and funny" and compared it to M.T. Anderson and Lemony Snicket; Kirkus called it "imaginative" and "engaging," and PW said it was "an auspicious beginning" to the series. And just the beginning is exactly what it is! Book two, THE IRE OF IRON CLAW (which involves Nikolai Tesla and sky pirates) will debut in spring 2015, and now we are pleased to announce that book three is scheduled for a year after that! THE TICK-TOCK MAN features Arthur Conan Doyle, J.M. Barrie, clockwork children, pickpockets, and all kinds of pandemonium. It's been signed by Lynne Polvino at Clarion (as have the others in the series) and will be illustrated again by James Hamilton. (And yes, there's a reason Kersten and the illustrator share a last name--he's her son!) It's going to be fabulous beyond belief! Jeanne Ryan's NERVE Goes to Hollywood! As I've been traveling this week, I'm a little late officially sharing this news that hit the airwaves earlier this week.—But later is by no means lesser when it comes to this exciting announcement: Over the past year and a half, Jeanne Ryan has been sitting on the fabulously exciting news that her fast-paced YA thriller NERVE has been optioned for film by Lionsgate Entertainment! The process of bringing a book to the silver screen, as many of you probably know, winds exceedingly slowly, but this week the beans were spilled and many juicy details can now be made public. The driving force behind this acquisition is producer extraordinaire Allison Shearmur, who has been joined by scriptwriter Jessica Sharzer (co-executive Producer of "American Horror Story"), and most recently "Catfish" directors Henry Joost and Ariel Shulman to direct. Of course, there are still many steps yet to go before we can all start buying movie tickets, but this is certainly a good solid series of steps in the right direction. And... if you haven't gotten your copy of NERVE yet, what are you waiting for? It's a thrill ride like no other, guaranteed to leave you breathless. Go forth and read! 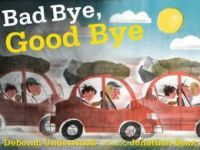 A STARRED Review for BAD BYE, GOOD BYE! It's a Publisher's Weekly STARRED review for Deborah Underwood's BAD BYE, GOOD BYE! We love what they had to say about Deborah: "Underwood's (The Quiet Book) ultra-succinct verse hits all the emotional marks that go along with a big transition." That's well-deserved praise! Congratulations, Deborah! BAD BYE, GOOD BYE is available April 2014. Check it out! I WON A WHAT? is about a kid who comes from a very orderly household, whose existence is turned upside-down when he wins a whale in a carnival game. At turns funny and heartwarming, this little story is going to be really fun to watch develop illustratively (although no illustrator has been chosen yet). 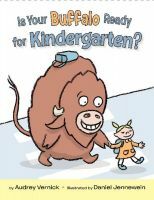 It should fit right in with IS YOUR BUFFALO READY FOR KINDERGARTEN? on bookshelves. Happy book birthday to THE REAL PROM QUEENS OF WESTFIELD HIGH! A very happy book birthday to Laurie Boyle Crompton and THE REAL PROM QUEENS OF WESTFIELD HIGH! We wish this fun story into the hearts of its readers! Come and meet Carol Brendler's new friend, RUBY MUTCH! Picture books are one of life's truly awesome pleasures. And never more so when you have that delicious zing of matching a project with its absolutely perfect, couldn't-be-better home. That's amply the case this week, where I am delighted to share a brand new deal for versatile author Carol Brendler. Carol's first novel, RADIO GIRL, was released in Fall 2013, and you will be able to enjoy her picture book, NOT VERY SCARY, this fall (with illustrations by the supertalented Greg Pizzoli!). But today we're here to talk about an especially brand new and shiny project, a picture book called RUBY MUTCH HAS HAD ENOUGH. It tells the story of two sisters who have two of everything, including each other. But what happens when one of them has had enough... and decides to move away? By turns hilarious and heartwarming, this is a true celebration of love and family and the things that really matter. And with Carol's ear for language and pitch-perfect sense of rhythm, it's a delight from the first word to the last. So, with much excitement and enthusiasm, so thrilled to share that we have found the perfect home for RUBY MUTCH: it will be published by the illustrious Anne Hoppe at Clarion—where she is even now on the hunt for the perfect illustrator. Hooray!